With a stripped down, return to the classics style of writing, Math Bird has created a book that drips with a sense of nostalgia for the days when books flexed their muscles through economy of words, potentially double-crossing dames, and plots that were launched with nitro slapped on their backs. 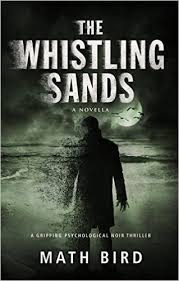 In The Whistling Sands, Ned Flynn is hired by a local business man, Mason, to find Mason’s wife, Nia. Nia has left Mason for another man and Ned is tasked with bringing her back through any means necessary. Ned finds her, and in true noir fashion, falls for her and becomes determined to save her from any revenge Mason may look to inflict on her. As Nia’s version of truth clash with Mason’s and even Ned’s, Ned must wade through a minefield of potentially explosives lies, deceits, and treachery to determine if Nia is the dame in distress she claims to be, or the gold-digging femme fatale others warn him she truly is. This book will give you the same feeling you get when you watch a new sitcom. The characters may feel familiar, the plot a bit well worn, yet you find yourself sucked into the story and you will soon find yourself invested in every word, sentence, and paragraph. Bird does a fantastic job keeping this story moving forward and cutting out extraneous plot points, leaving you with a story that is a fast read with never a dull moment. I really enjoyed this book and it deserves a look from all lovers of noir fiction.